We live in a fully connected era where many jobs must constantly be reinvented, and their format adjusted. Things have changed for a whole generation of professional trainers as well. Not so long ago they focused mainly on face-to-face long-term trainings, whereas now people are mostly interested in continuing education. Employees have changed, too: in 2026 generation Y will represent 75% of the active population. And how do you think this generation will learn? Using a blackboard and chalk? Let’s be serious! In today’s world, we need to have access to education whenever we want, be it on the bus on the way to work or between two meetings at the office. Digitalization of your trainings will not only be the right response to the changes in the modern world, it will also allow you to improve multiple parameters. Digital technologies have a specific goal: to make your trainings more dynamic! Changing the medium that you use means changing the look of it as well: if you are using digital technologies, the content must be attractive. 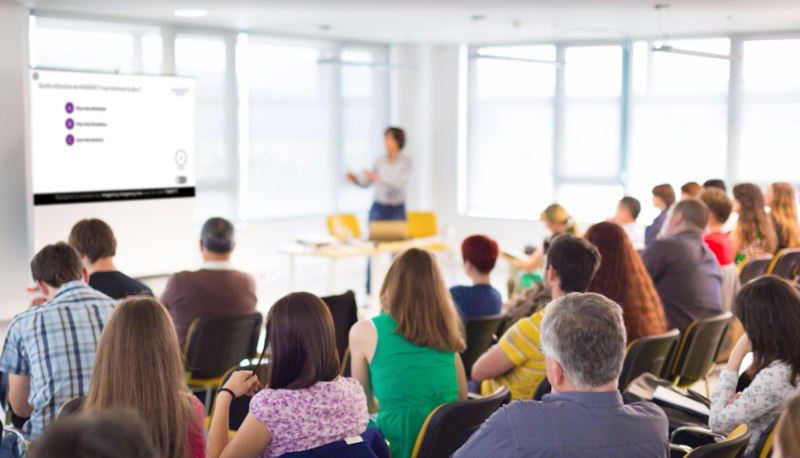 In order to get your participants fully engaged, try making your training sessions more fun: digital technologies allow you to create different scenarios and encourage interaction, which helps attendees to memorize the information and keeps their attention high. It’s no secret: people learn better when the program is customized. At the same time, if you want your trainings to be cost-effective, they should be suitable for different groups. Going digital allows you to combine both and create an adaptive learning program which can be personalized according to the profile of each participant. · Improve the rate of success to the point of making the counters explode: your trainings will be 200% efficient. Blended learning is an appealing and tasty mix that combines face-to-face trainings and distance learning. Despite all the advantages of digitalization, only 50% of participants complete their distance learning program compared to 90% of those who learn in a traditional way. The solution is to combine the two: this method allows to mix face-to-face trainings and distance learning thanks to platforms like MOOC or apps for learning between meetings. Gamification is an important tool of digital learning that helps to capture the attention of the audience. Social and fun-filled game formats, such as serious games, immersive learning, augmented reality or casual games have proved their worth in French companies. The engagement of the trainees is stimulated by specific study cases where the aspect of reality encourages immersion and memorization. The game brings change on both sides: « The trainer goes from being a teacher to being a performer. He becomes an animator who plays and juggles with knowledge, puts it to work and focuses on the game instead of himself”, says Aurélie Dieu, professional trainer. If we could convert digitalization into a currency, that currency would be… data! Collecting and analyzing data will allow you to measure the learning rate, the participants’ satisfaction and the return on your training investment. Once again, going digital makes collecting this information easy thanks to a set of simple digital tools. Sparkup, for example, allows you to gather and analyze all the data generated after the training session in order to measure its efficiency and to adapt the study program to the needs of your participants.